In this new episode, Susan and Kitty are hosting a new episode all about the sinister symbiote that makes Spider-Man’s life a nightmare! This venomous villain has spawned countless new criminals and amassed a huge fan following ahead of his big screen solo debut- It’s Venom Then & Now! What began as the idea for a single symbiote has morphed into one of the most well-known Marvel villains to date. This venomous villain has taken many forms and spawned quite a following as one of Marvel’s fan favorite bad guys- now he’s even starring in his own solo film. Still, Venom is a sometimes-antihero, absolute alien menace whose presence changed the Marvel Universe, and Spider-Man’s story, in ways that no fan could have ever predicted. While the true nature of symbiotes has remained quite mysterious ever since Spidey brought home that fateful black suit, modern Marvel writers have taken their turns at adding lore to the legacy of this crazed character. In the most recent run of Venom by Don Cates and Ryan Stegman, the symbiotes have an origin that is as storied as the oldest gods of the universe. With the introduction of Knull, the revelation of the true meaning of the word “Klyntar”, the symbiote hivemind, and Venom’s new abilities (like growing wings! ), this character’s presence in Marvel Comics has exploded and evolved in entirely new ways. One challenge the upcoming Venom film will have to overcome is the fact that Spider-Man is not present (that we know of) in the origin of Eddie Brock becoming Venom. 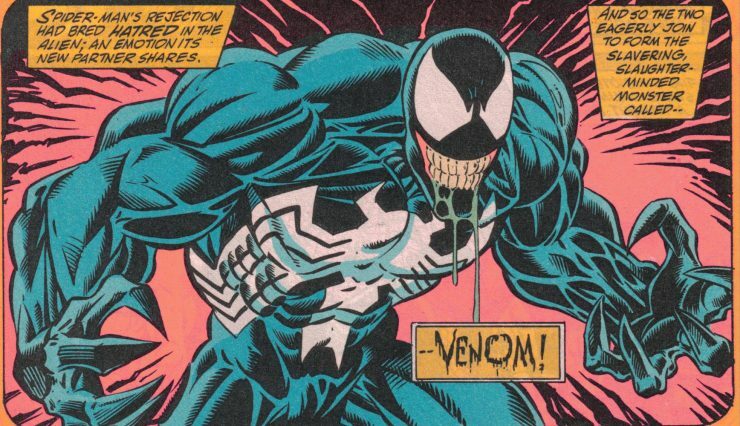 This key element has always been a factor in Venom’s creation, meaning yet another origin for the symbiote villain will be hitting the screen fairly soon.